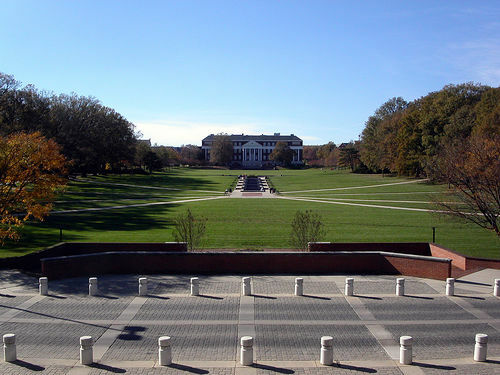 Does the University of Maryland Care Enough About Transit? How would transit affect the heart of the University of Maryland's college campus? Photo by forklift. There’s been lots of buzz this week in College Park, Md. about accessibility and transit. First, early this week, there were reports of the controversy surrounding the school’s plans to close Campus Drive to private vehicles and many buses for eight weeks this summer as a test-run for longer-term plans to create a “traffic-free, pedestrian-friendly zone” in the middle of campus. All of this controversy coincides with recent progress on making a decision for how to integrate the University of Maryland’s campus with the proposed Purple Line light rail system, a 16-mile route that would link Bethesda to New Carrollton. It seems there’s been an agreement on how the line should run through the University of Maryland campus: It will be partially underground. This ends years of debate between Maryland Transit Administration officials, who said that running trains at street level along the campus’ main thoroughfare — Campus Drive — would be convenient and cost-effective, and school administrators, who feared the at-grade Campus Drive route would split the campus in half, destroy the campus’ scenery, endanger bicyclists and pedestrians, and disturb sensitive research equipment in science buildings. (Check out Rethink College Park for a history of the debate, including a timeline of the “Alignment Controversy”). What’s the deal? Why do some campus officials seem so averse to transit?